Dana Boyd Miller clips exotic scenes onto horses during her clipping demonstrations. Photo by Cyndie Planck. 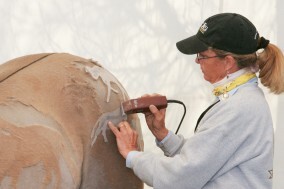 Body clipping might be one of the most dreaded equestrian chores—the itchy hair that deposits itself all over your body, the loud noise of the clippers, the methodical monotony of the task. Enter Dana Boyd Miller, professional body clipper. Miller clips between 500 and 600 horses a year, and she’s been doing so for more than 20 years. It isn’t quite the career she thought she’d end up in, but it’s a life that’s treated her well. Miller, 52, lives in Loxahatchee, Fla., and her busy season ramps up in the fall, when all the show horses hit Florida for the winter. She stays busy during the summers with a few body clips a week and some trimming and mane pulling. “That’s the time I get to hang out and play with my own horses,” Miller said. She has two horses at the moment—a cutting and reining horse and a working cow horse—and she rides for enjoyment rather than any competitive goals. Miller’s schedule is also punctuated by the occasional trip to equine expositions, where she conducts educational lectures and demonstrations about clipping as a representative of the Andis clipper company. She entertains the people who gather to learn about clipping with inventive and decorative scenes, which she clips into the demo horses’ coats. While body clipping might not have been the career Miller dreamed about as a horse-crazy teen, she always knew she’d be involved with horses. She grew up in South Florida riding hunters and jumpers and got a good base of horsemanship. “My parents were pretty cool in that they said, ‘Yes, you can go do the horses, but you have to earn your money to do it.’ So, I did pretty much everything from babysitting to cleaning tack, stalls, braiding and clipping to make money so I could ride and show,” she said. After she graduated from high school. Miller did some teaching and training in the local hunter/jumper scene, but in her 20s, she worked with Thoroughbred racehorses, starting the yearlings and 2-year-olds for the track. By the late ‘80s, she was ready for a change. “I had been getting on 18 horses a day for 12 or 13 years. When I was burned out, I was very much done,” she said. She became the assistant director of Carriage Hill Farms, a large hunter/jumper show barn in Delray Beach, Fla. There, she started clipping regularly, but she always intended to get back into training and teaching. “But I started making a living just clipping, and it got to the point where I couldn’t afford to not clip,” she said. By 1991, Miller had started her business, Body Clipping By Dana, and established a loyal clientele through her extensive contacts in the show world. As her business grew, Miller saw the need for a reliable clipper blade sharpening and clipper repair business in the area. She suggested that her parents, a retired computer specialist and receptionist, take it on. “Our situation was a little backwards. Usually parents hand a business to a kid, but I handed a business to my parents,” she said. Her parents now run Milbern’s Shaver Center out of Lighthouse Point, Fla.
“My mom, for so many years, said ‘We can’t make a living doing that.’ But I said, ‘Yes, you can, because there are so few people who do it well.’ They ended up with a great business with a lot of repair warranty work. They’re so busy they’ve had to hire someone. I look at my mom and grin and say, ‘And you thought you wouldn’t have enough work to keep busy,’ ” Miller said. It was actually Miller’s father who initiated her connection with the Andis company. In the late ‘90s, after 10 years of clipping full time, Miller’s body was feeling the effects. She’d been using the traditional large clippers, and her arms were suffering. “To get dressed in the morning, I was lifting my arm with my other hand because I had tendonitis so badly I couldn’t lift my arm. I thought I’d have to go back to teaching,” she said. “They said ‘Clips what?’ They had no clue that there was an equine market. They asked if they could come down and watch me, since they really didn’t have any idea. Then they asked if I’d be interested in making a DVD for a first-time owner, so if you’d never clipped, you could watch the DVD and then go clip your horse. I said sure, and then that turned into them sending me around the country doing lectures and demos at a lot of the equine fairs and expos,” said Miller. By 1998, Miller had an established relationship with the Andis company, and she enjoys sharing the knowledge she’s gleaned in decades of clipping. “It’s allowed a lot of people to get educated about how to get along with their horses while clipping them and make the job easier for them and for the animal,” she said. “A lot of my specialty is that I get along with the horses pretty well because of having so much experience from starting youngsters. I’m good at reading their body language and being aware of what they’re getting ready to do, and I like teaching people to open their eyes to that,” she continued. Because clipping horses is her life’s work, Miller has some excellent advice for those who wonder what to wear when picking up the clippers themselves. She has a separate space in her house for the clothes she wears while clipping. “They don’t cohabitate with my other clothes!” she said. Miller always wears a ball cap when clipping. “I used to wear a bandana tied over my head, but I’ve found that the visor of the ball cap helps with the glare. I always cover my head. I don’t want the horses’ hair in my hair, because I’ve worked on animals where you can’t get the clippers through the hair, and you realize it’s because they’re loaded with lice,” she said. Miller looks for shoes with support, since she works on her feet, but she doesn’t wear traditional running shoes. “My shoes are leather-topped so that the hair doesn’t get into them. Really comfortable sneakers usually have mesh tops, but the mesh holds the hair into my feet,” she said. Learn more about Dana Boyd Miller and see photos of some of her extraordinary clipping creations on page 66 the Dec. 12 issue of The Chronicle of the Horse.